In a large bowl, combine the cake mix, water, 3/4 cup cream of coconut and egg whites; beat on low speed for 30 seconds. Beat on medium for 2 minutes. Pour into three greased and floured 9-in. round baking pans. Bake at 350° for 22-26 minutes or until a toothpick inserted near the center comes out clean. Cool for 10 minutes before removing from pans to wire racks to cool completely. For filling, in a small saucepan, combine the evaporated milk, chips, cream cheese, 3 tablespoons heavy cream and remaining cream of coconut; cook and stir over low heat until chips are melted. Remove from the heat; stir in 1-1/2 cups coconut and 1 teaspoon vanilla. Transfer to a large bowl; cover and refrigerate until mixture reaches spreading consistency, stirring occasionally. For frosting, in a large bowl, beat remaining cream until it begins to thicken. Add sugar and remaining vanilla; beat until stiff peaks form. Place bottom cake layer on a serving plate; spread with half of the filling. Repeat layers. Top with remaining cake layer. 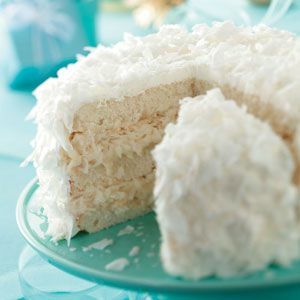 Frost top and sides of cake; sprinkle with remaining coconut. Refrigerate leftovers. Yield: 12 servings.